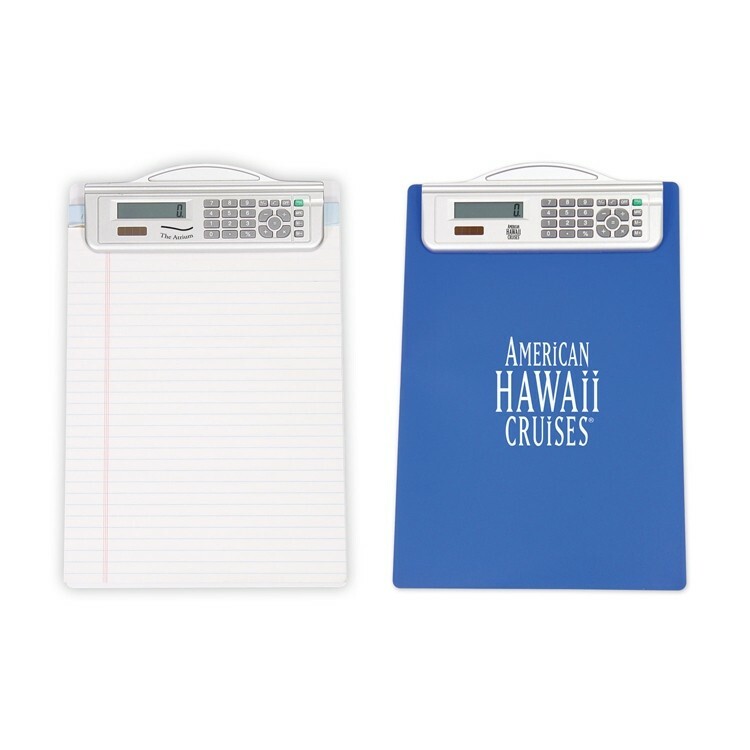 Calculate the opportunities for success with these ingenious clipboard/calculator combinations! 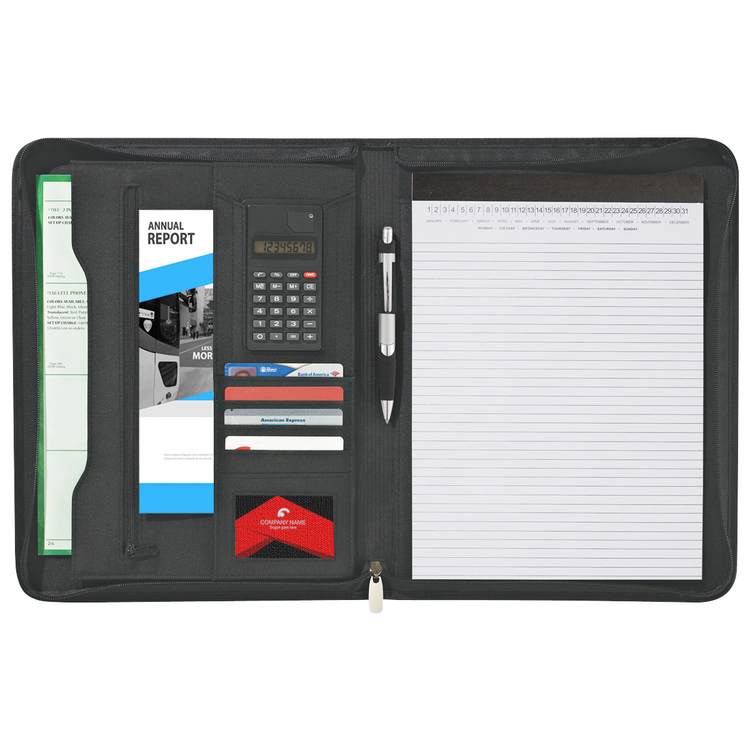 Perfect for teachers, students and accountants but also sales representatives and warehouse managers. Imprinting available either on the clipboard or the calculator. Please specify imprint area when ordering. 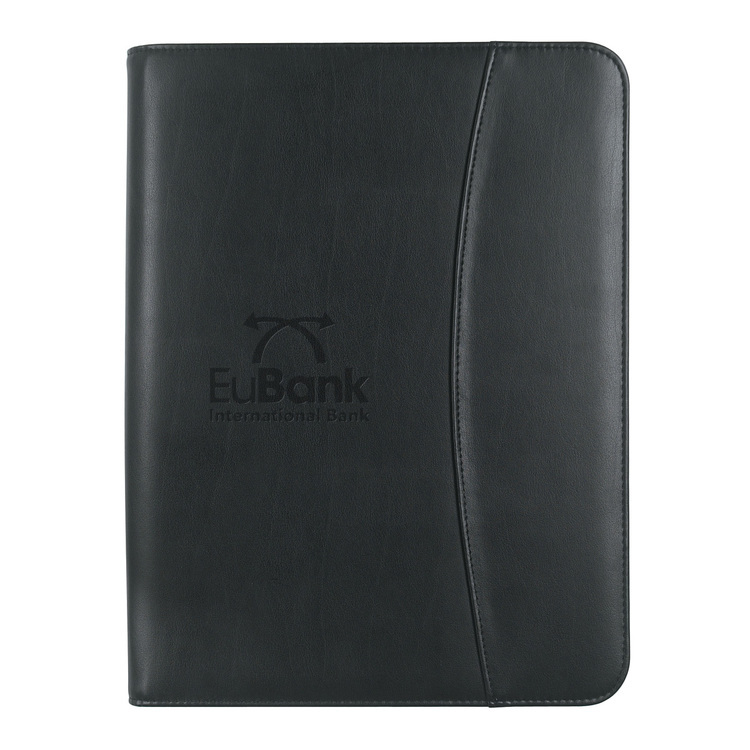 Add your custom imprint and stay connected to your valued clients. 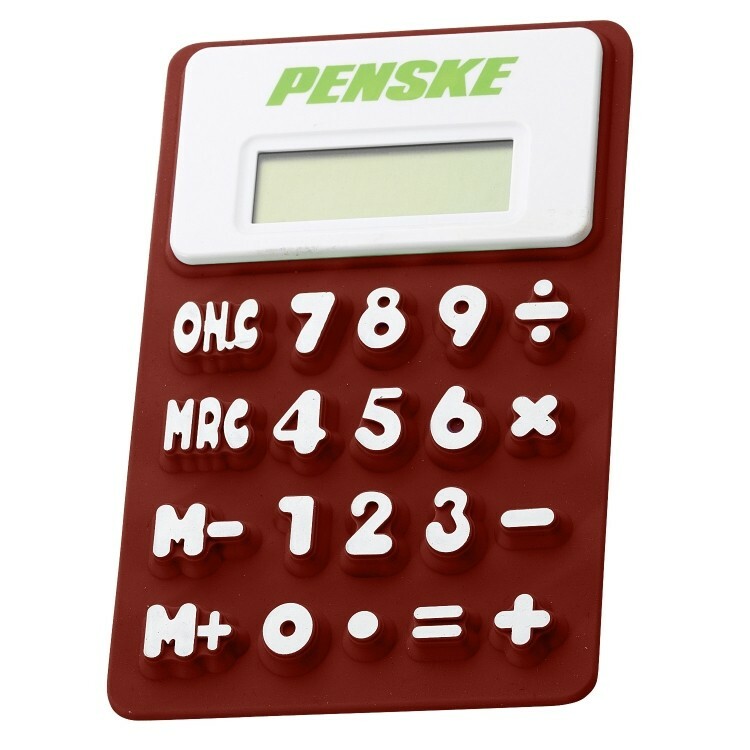 This plastic pocket sized flip cover calculator with rubber grips is a fun product with a unique opening mechanism. 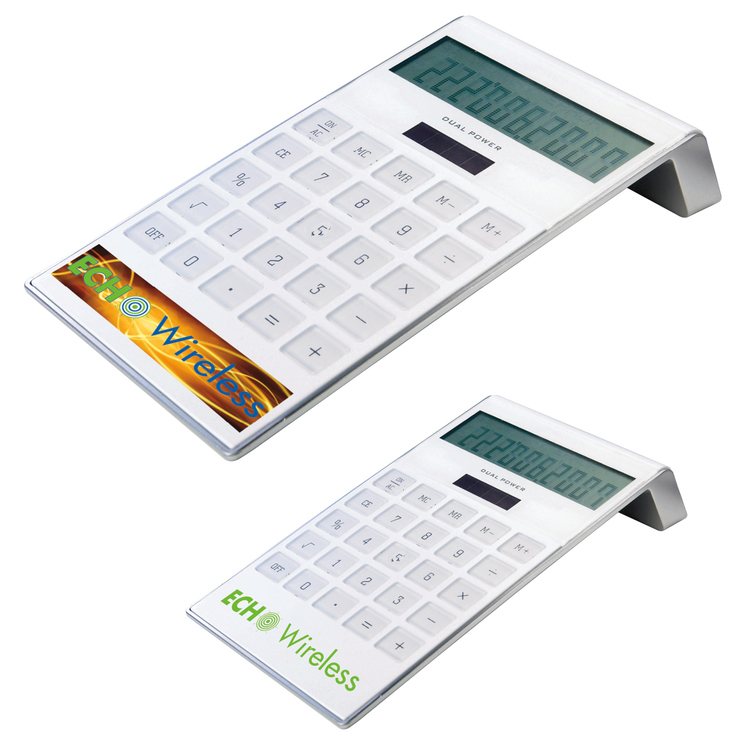 With a push of a button, the cover flips open to reveal the display and elevate the calculator for easy use. Powered with button batteries. 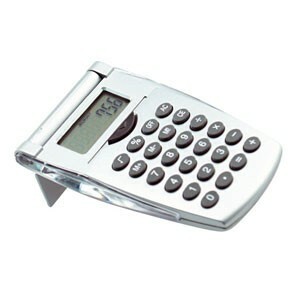 Robotic Flip Calculator - Silver Calculator with clear accents. 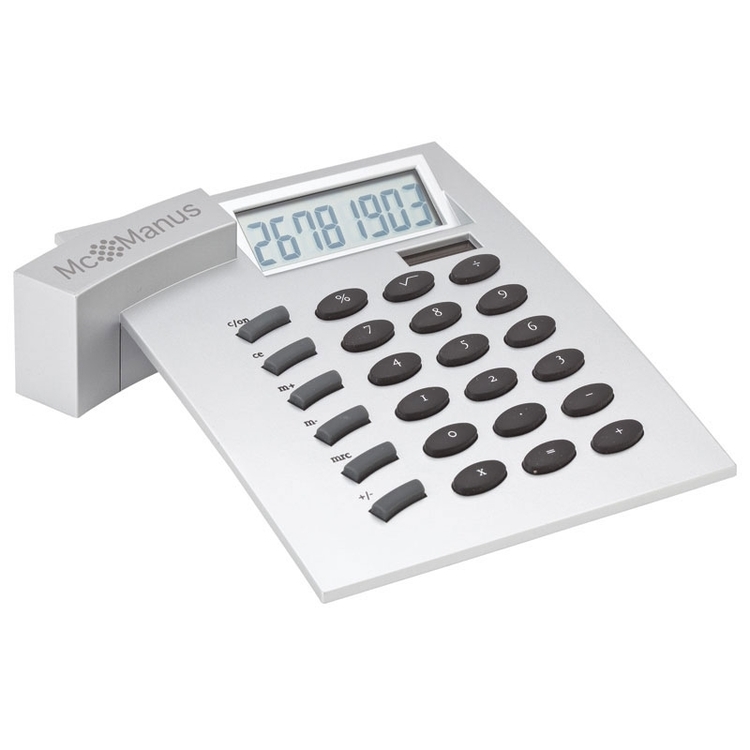 Flip piece becomes your calculator stand when placing this on your desk or table. 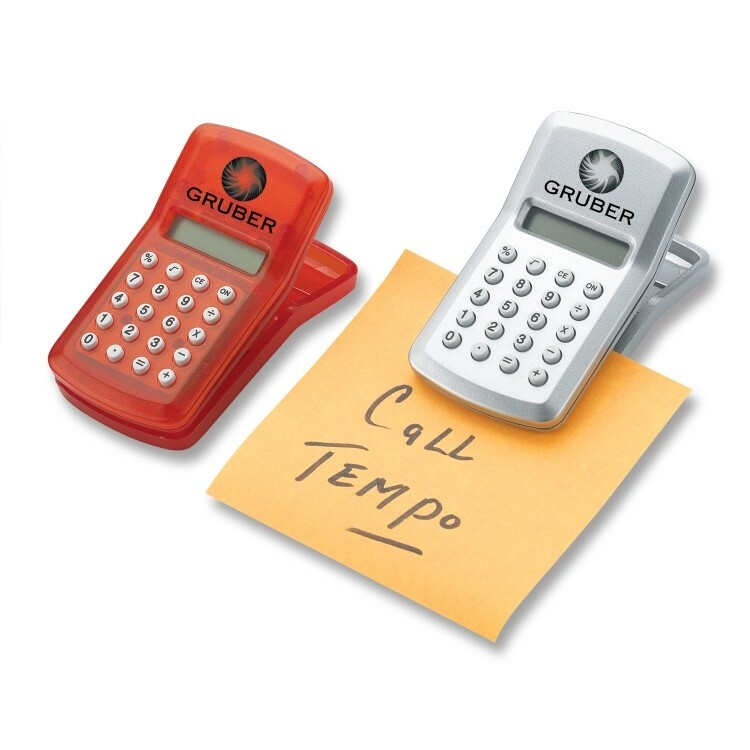 Also easily hand held for crunching numbers in a hurry. 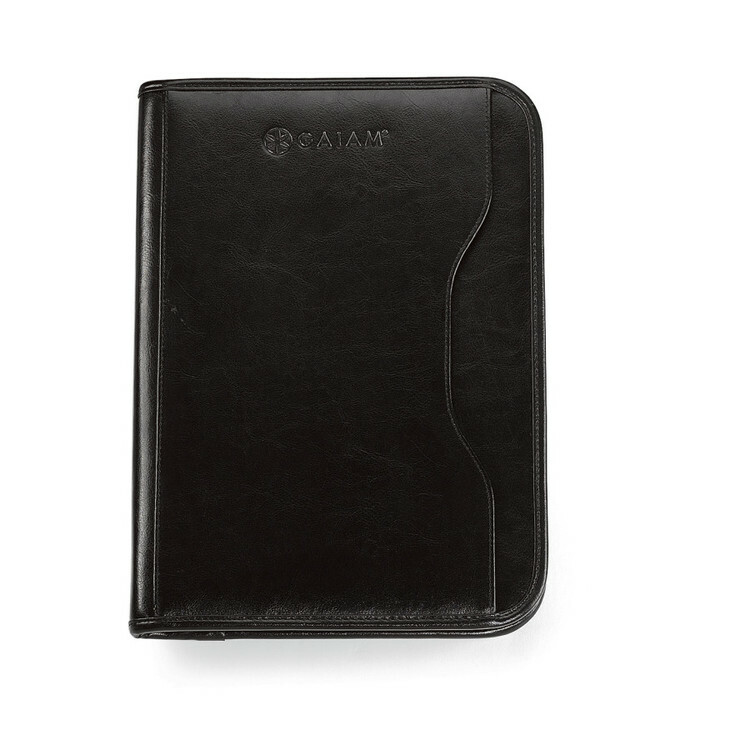 Fits in a purse or briefcase for handy access and calculating on the go. This weekly calculator is perfect for planning projects. Point the start arrow at the date your project will start and calculate the end date based on the number of weeks it will take. 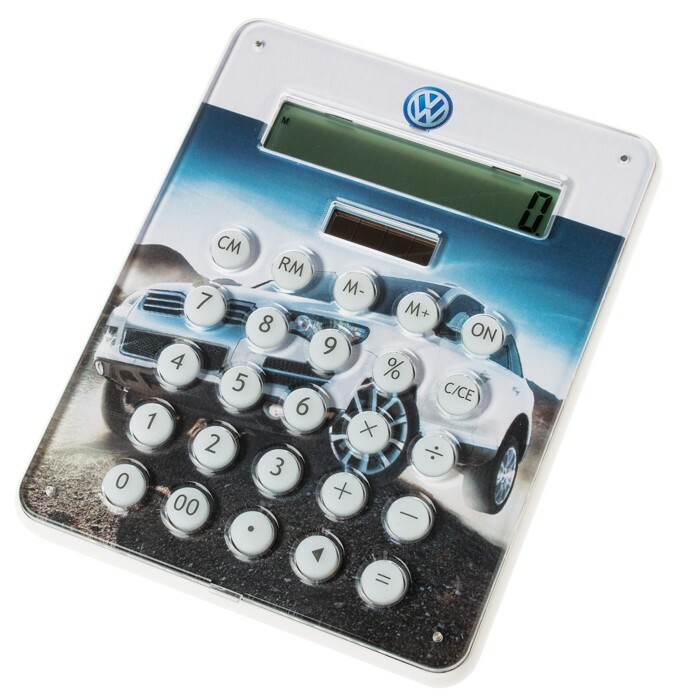 Show your creativity by branding your solar calculator with your own unqiue style & flavor. 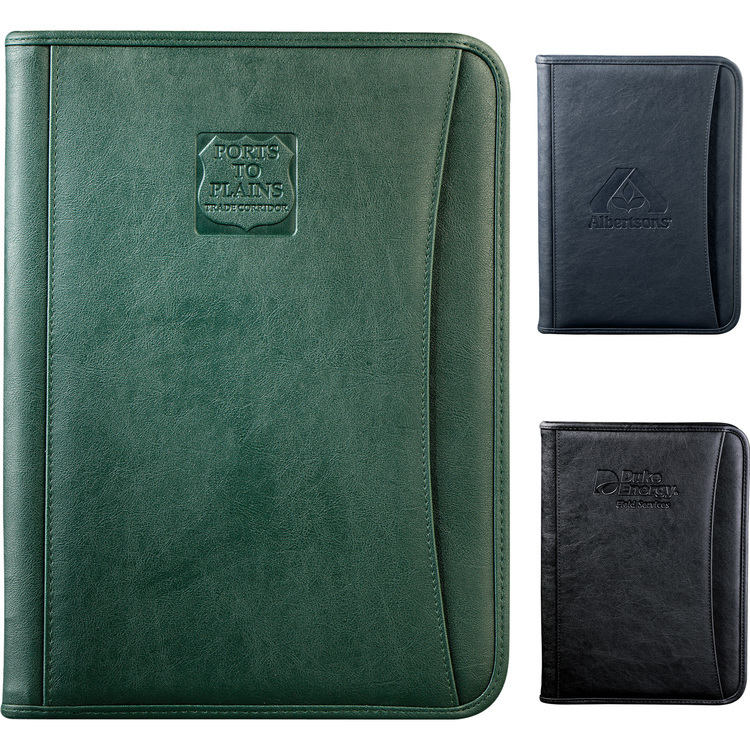 Distribute a 1 of a kind desktop item that has been customized only by you. Features transparent calculator body. No batteries needed, solar powered. 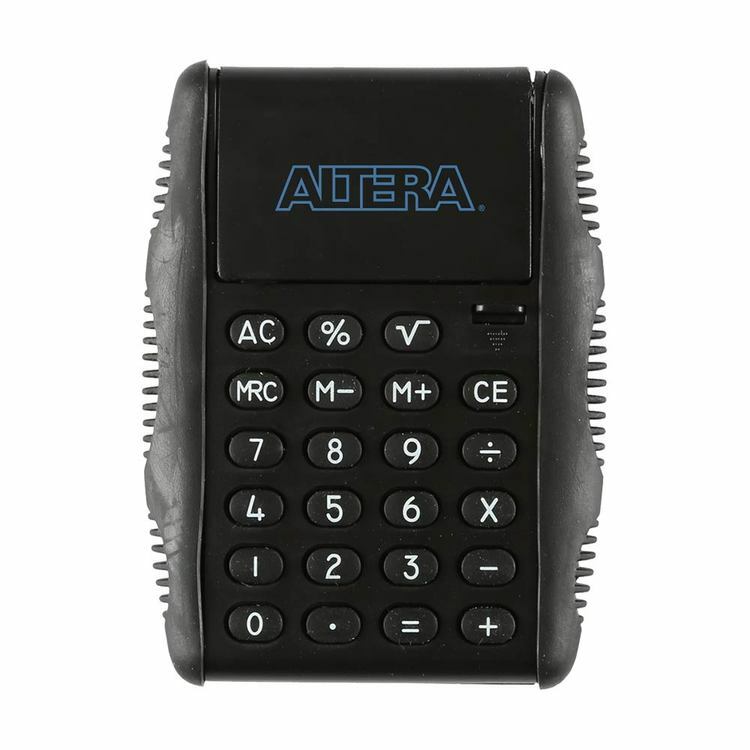 Speak the international language of math with this slim calculator. 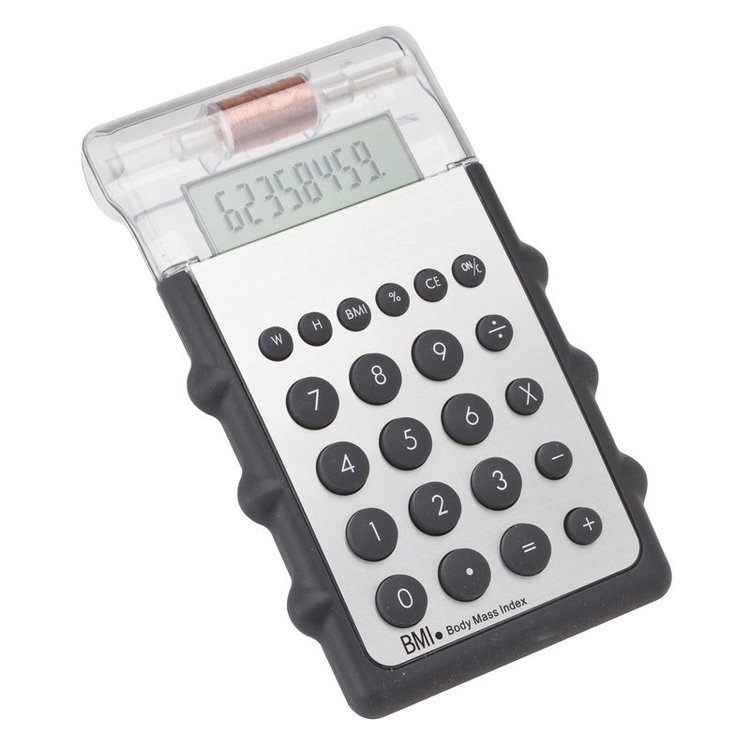 Featuring a sleek design with rubber keys, side grips, and an 8-digit display, this calculator is bound to come in handy. 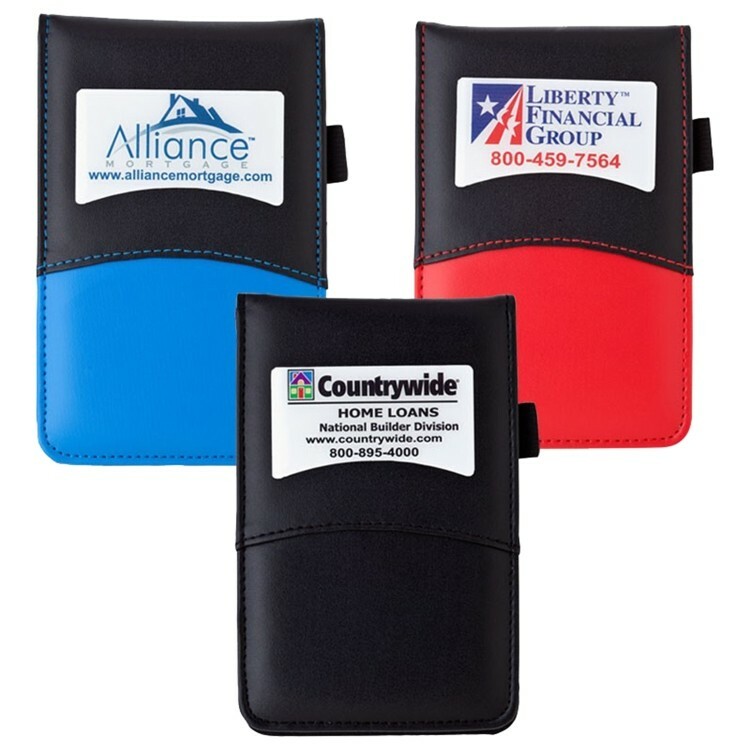 Customize the 1-1/4" x 1/2" imprint area with your company logo in one of a variety of vivid colors to create an ideal promotional item that anyone can use and take anywhere. What a practical and attractive gift! All in One Folder! 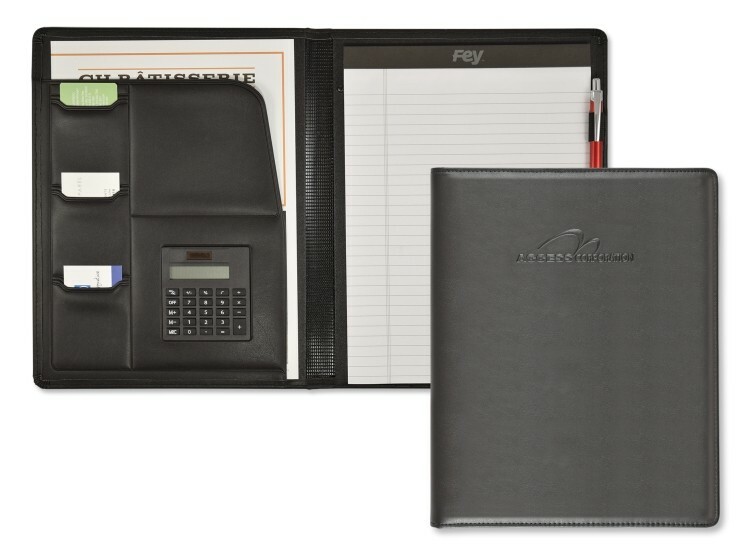 This is not just any desk folder… It's a calculator desk folder! 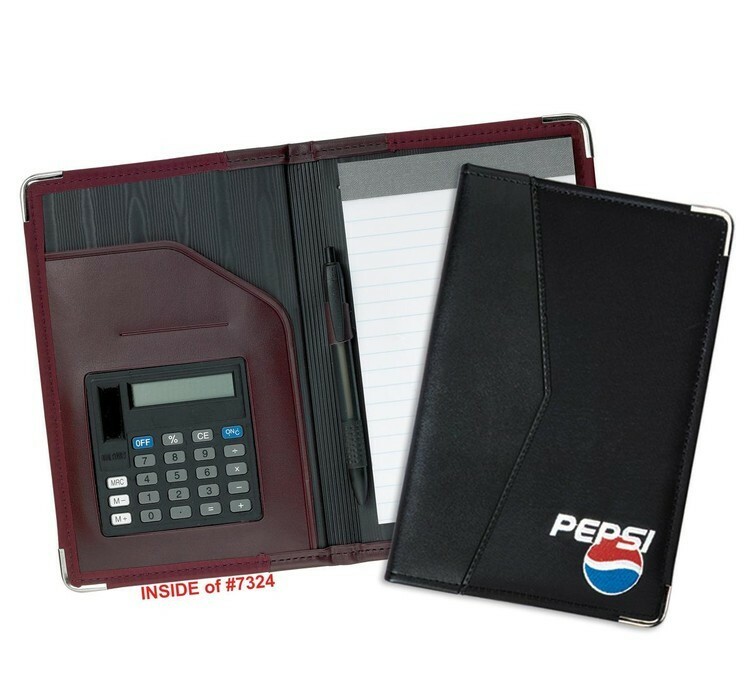 Dual powered calculator with large display and additional organization with a microperfed ruled pad, five interior pockets and an elastic pen loop. 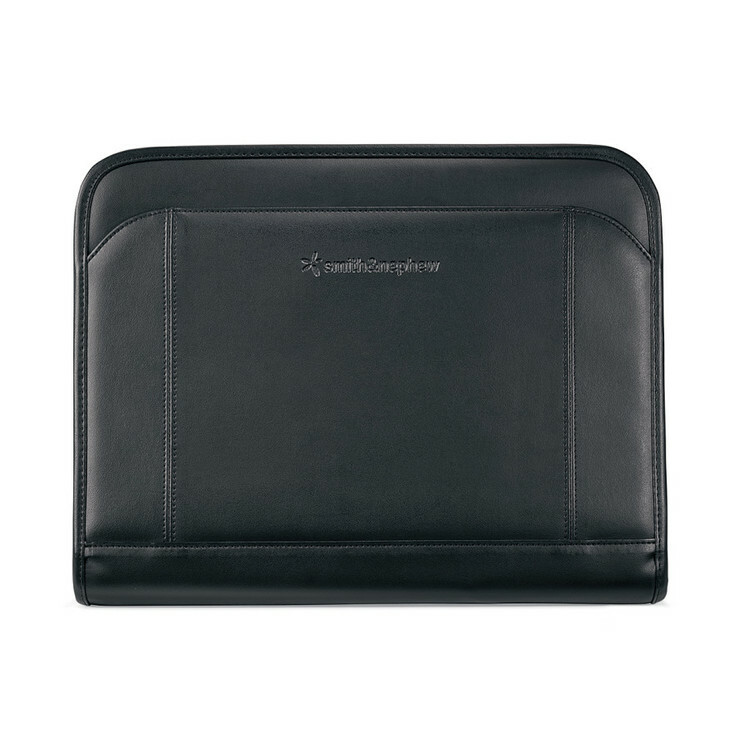 Setting the stage for optimal organization is what this folder does best! 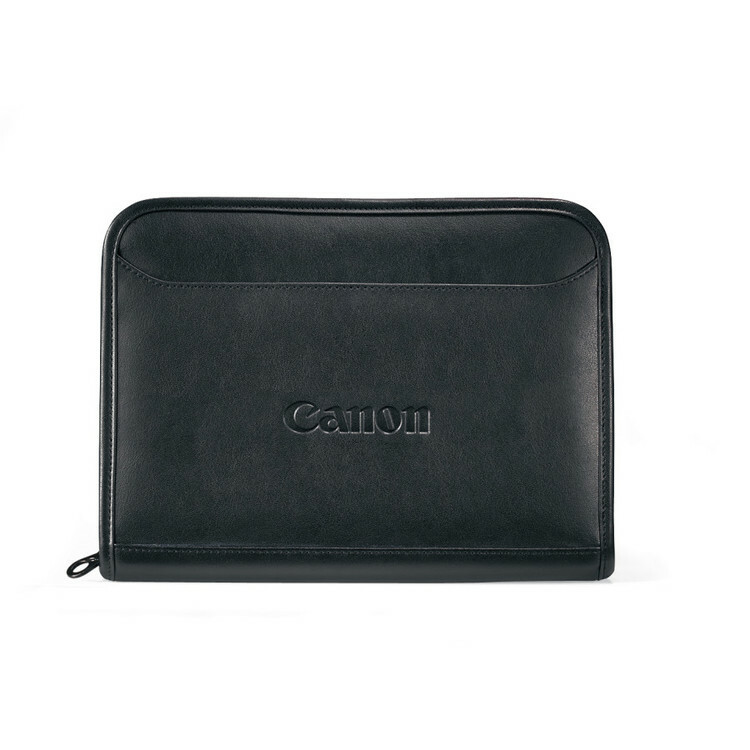 Black material with black stitching and padded covers. Pen not included. 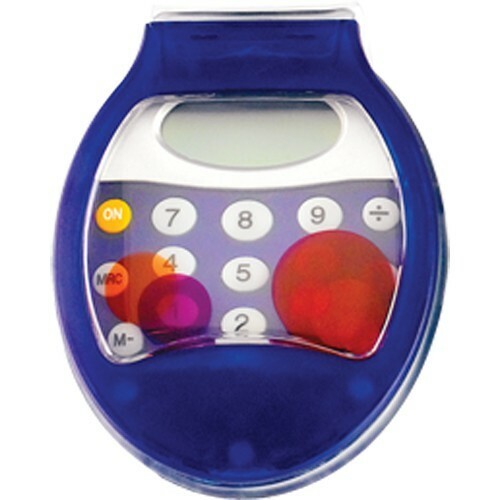 Whimsical Bubble flip calculator has multi-color floating bubbles in the easy to flip clear cover. Batteries included. Individually boxed. 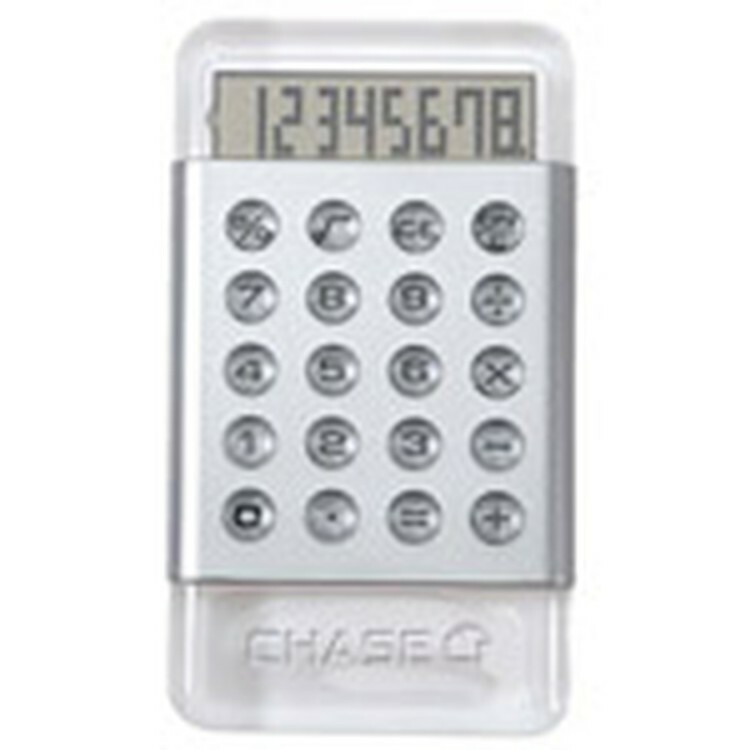 Shimmering optical acrylic accented with satin silver case 8-digit calculator. Features raised acrylic easy push buttons. 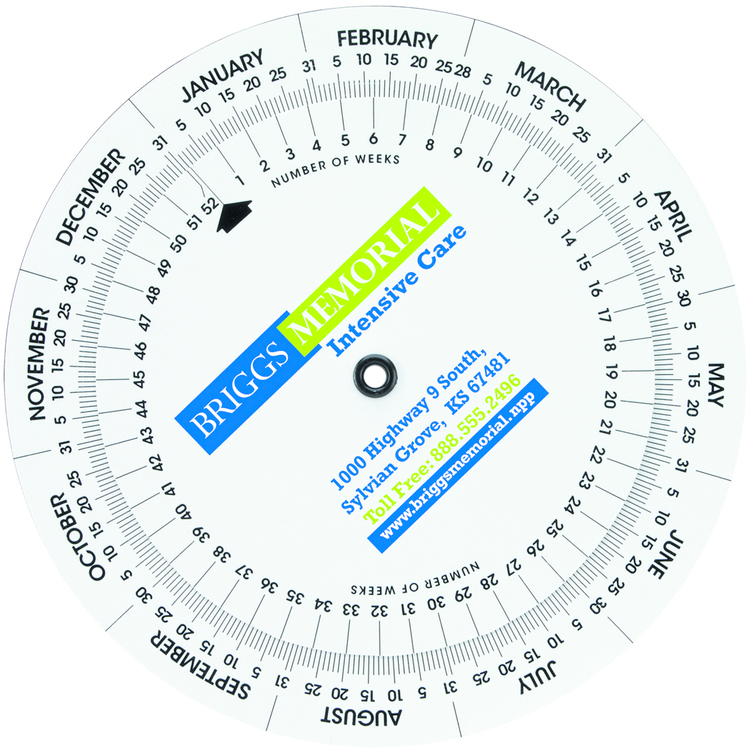 ON SALE Watch your clientele add up with this marketing campaign! 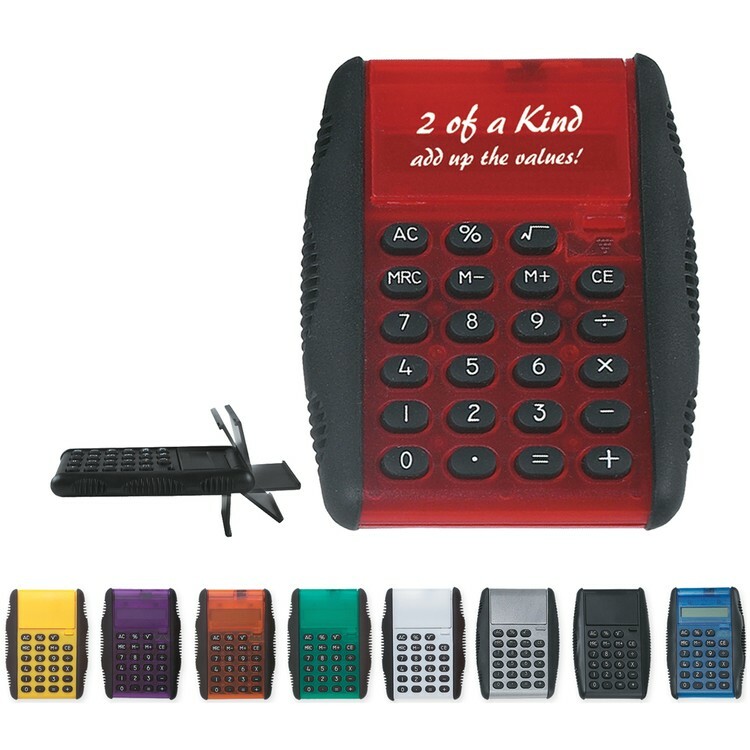 The Kinetic calculator features a cover that flips open into a stand and a soft rubber grip on both sides. 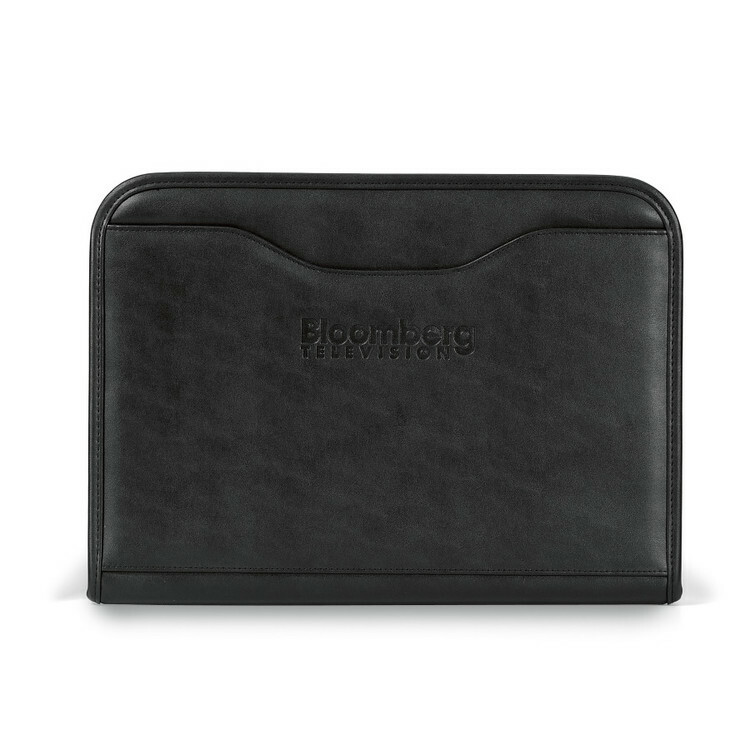 Perfect for promoting banks, accounting firms, and other financial services. An excellent handout at trade shows and conventions. 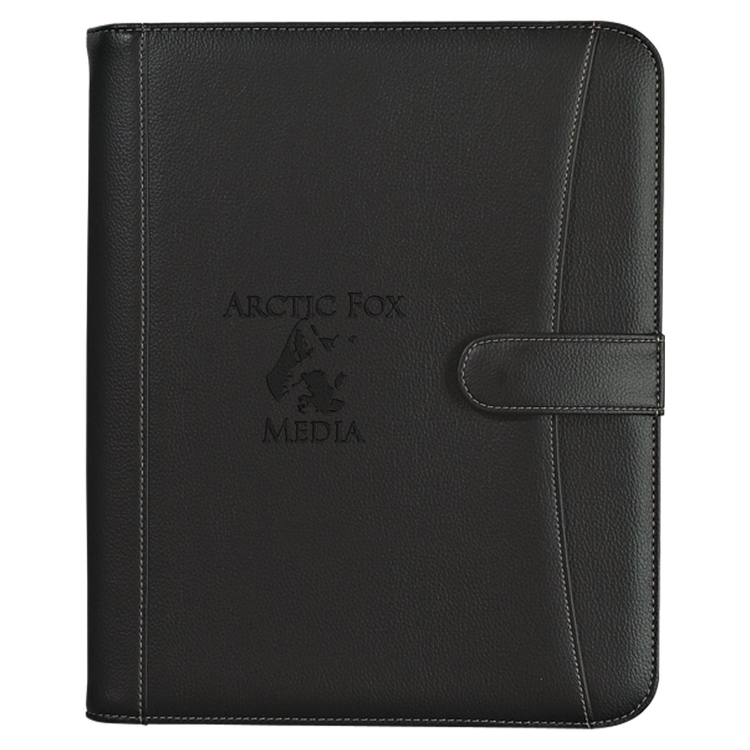 May be customized with your company name and logo or purchased without imprint. Measures 3" x 4" in size. 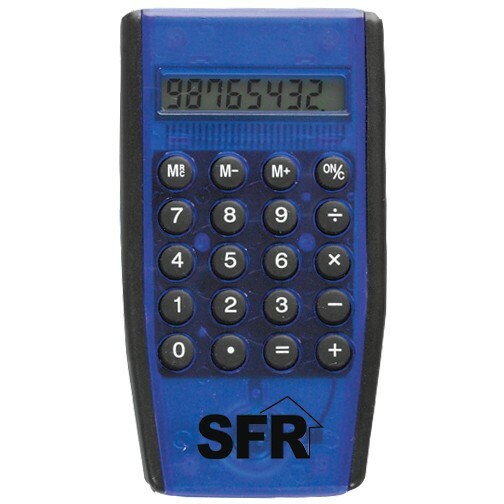 Shaker technology makes this calculator always have power to calculate. Add up the sales with the flip top calculator. 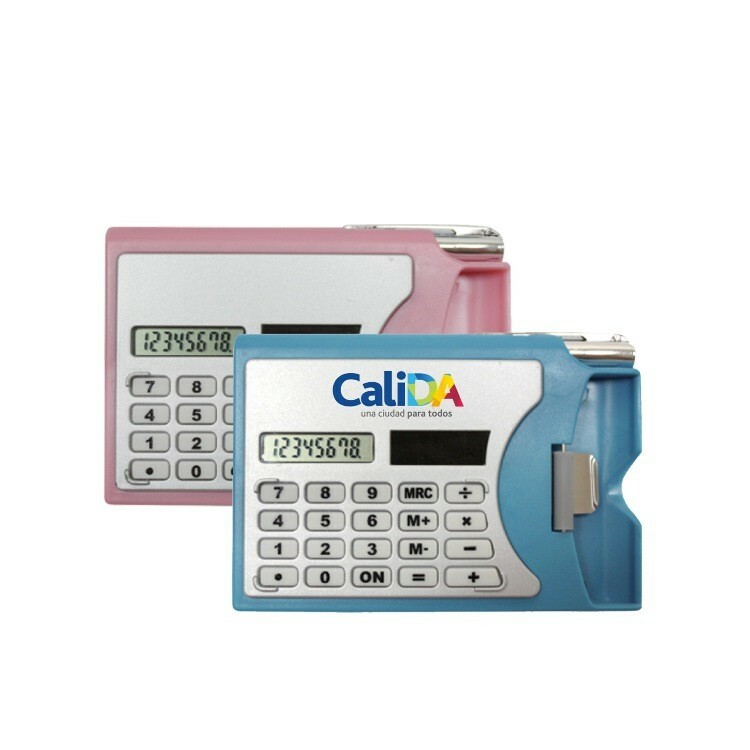 Our flip top calculators come with full function 8 digit display, soft touch keys and side grips for ultimate comfort, and a cover which opens automatically upon pushing a switch. Battery is included. 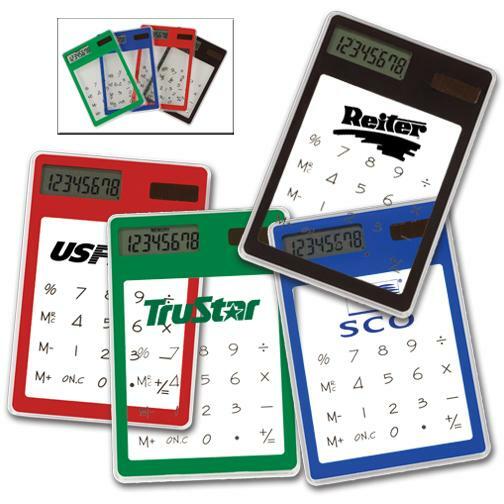 Your clients will love this great flip calculator promotional product. 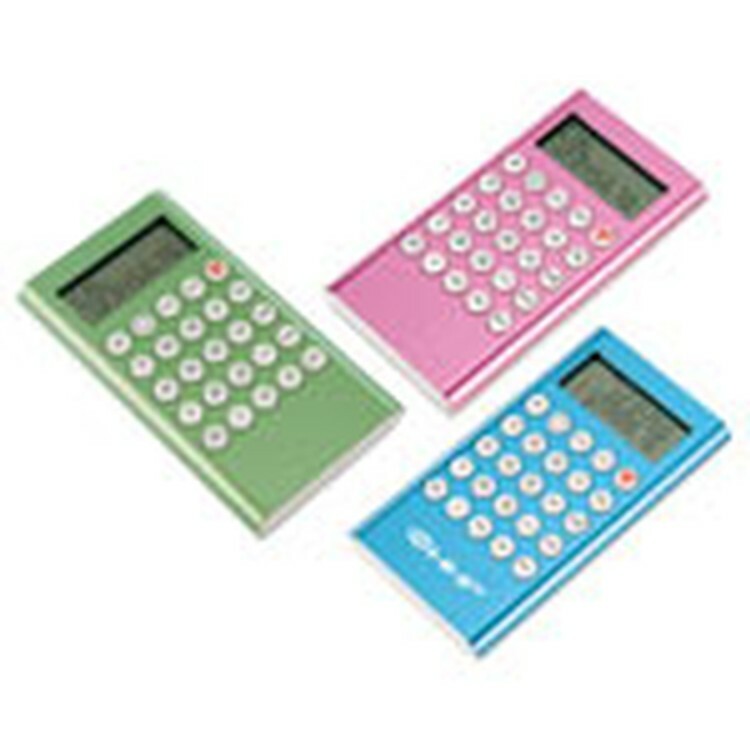 Delightfully eye-catching metallic color metal dual power conversion calculator. Features metric (in-cm, ft-m, mile-km, gal-lit, lb-kg, F-C), currency & tax rate converter. Available in Metallic Blue-BU, Green-GN & Pink-PK. 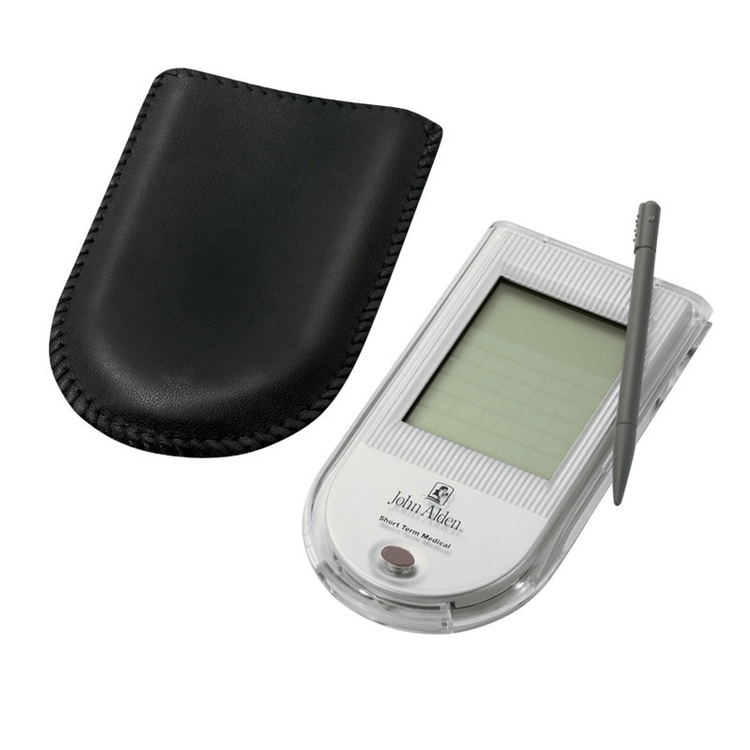 A plastic pocket calculator holds and protects up tp 12 standard business card with one ballpoint pen. Just slide your finger over the roller to dispense one your card. Close out item. First come first service. Sales while supplies last. Free 3 days rush service. Please indicate it on POs.